"Rav Elyashiv left a deep mark on the hareidi world and on the entire Nation of Israel," said the Prime Minister. Prime Minister Binyamin Netanyahu expressed deep sorrow over the passing of Rav Shalom Yosef Elyashiv. 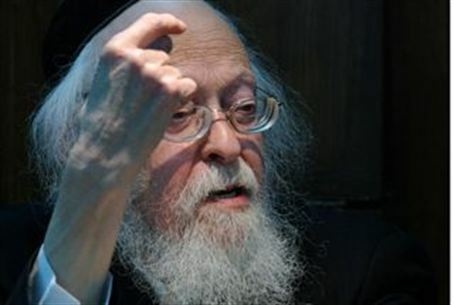 "In his decisions, Rav Elyashiv left a deep mark on the hareidi world and on the entire Nation of Israel," the prime minister said in a statement. "In his Torah scholarship and teachings the rabbi showed the way to many, who were empowered by his wisdom and the astuteness of his thinking. The rabbi's path was one of love of Torah and love of one's fellow man, of modesty and safeguarding the sanctity of life." "The Nation of Israel lost a great rabbi today; a sharp, strong decisor and a wise man, a shliach tzibbur ["emissary of the public" before G-d] who faithfully represented Torah values and knowledge, and the spirit of giving. We are pained by his loss." Knesset Speaker Reuven Rivlin said: "Today is a difficult day for the Jewish people. A great man of his generation and a leader has departed from us today – a man who raised the Torah world from the ashes after the European Holocaust and raised tens of thousands of students." "We have lost a distinguished man, a halakhic decisor and a great man, a Torah genius who has left a mark on the Jewish world and contributed to the bridge between the various streams in the Jewish people." "Rav Elyashiv was a modest visionary, a talmid-chacham and man of G-d.
"The rabbi's image will be remembered as a person whose spirit and mind remained strong, and who continued to study the depths of Torah, even when his body had weakened." Jerusalem Mayor Nir Barkat, city councilors and municipality management expressed their deep sorrow over the passing of Rav Elyashiv, whom they called "a Jerusalemite and the greatest spiritual leader in the Torah world." "Rav Elyashiv, a great leader and the posek hador [decisor of the generation], served as a dayan (rabbinical judge) and teacher of halakha for many years and raised thousands of students who pass on his heritage for generations," a statement issued by Barkat's bureau read. "Rav Elyashiv's figure has greatly influenced Jerusalem's status and his passing is a great loss for Jerusalem and the Nation of Israel." "In his unique approach, Rav Elyashiv ztz"l succeeded in leading tens of thousands, with public responsibility and commitment to all parts of the nation and the Israeli populace, in understanding and a love of Israel." "Jerusalem sends condolences to his sons, the rabbis, and all of his family members, to his thousands of students in Jerusalem, in the Land of Israel and in the entire world." "The International Rabbinic Fellowship together with the house of Israel mourns the passing of Rabbi Yosef Shalom Elyashiv, the leading Lithuanaian Haredi halakhic decisor, at the age of 102 in Jerusalem. Rabbi Elyashiv, a relative by marriage of the late, sainted, Rabbi Shlomo Zalman Auerbach, served for many decades as a dayan (rabbinical judge) in the Chief Rabbinate court system in Israel before retiring in the early 1970's. He then went on to devote himself to a life dedicated exclusively to Torah study and rendering halakhic decisions. In the last decade of his life he also became increasingly involved in serving as the guide of organized Lithuanian Hareidi Jewry on political, social and halakhic issues of the day. May his entire family be comforted amongst the mourners of Zion and Jerusalem."